It seems like an eternity ago I received an email from Ancestry.com offering me a free autosomal DNA test. (Still don’t know why I was selected…were all Ancestry.com subscribers offered the free DNA testing or only their most neurotic users that spend most of their non-working, waking hours searching family history?) I immediately signed up, and shortly thereafter received my DNA kit, swabbed my cheek, sent it back and have been waiting. This afternoon I received an email from Ancestry letting me know the results are finally in. I’ve been especially curious to see how they compare to FamilyTree DNA, which I took a couple years ago. So far, I’m very impressed with Ancestry.com’s very user-friendly interface. When viewing your DNA matches through Ancestry.com, you can filter matches by ethnicity. If I only wish to see those who also have Central European ties, I can click a link to see potential cousins. Of course, some of these cousins may also have other matching ethnicities, but it is one way of reducing the list of matches if you are wishing to search for potential cousins by geographic location. While I don’t have any new leads or other earth-shattering discoveries on Day 1 of receipt of my Ancestry.com DNA results, I am very impressed with the user interface, the ability to view connected family trees, and the ease in which one can filter results. 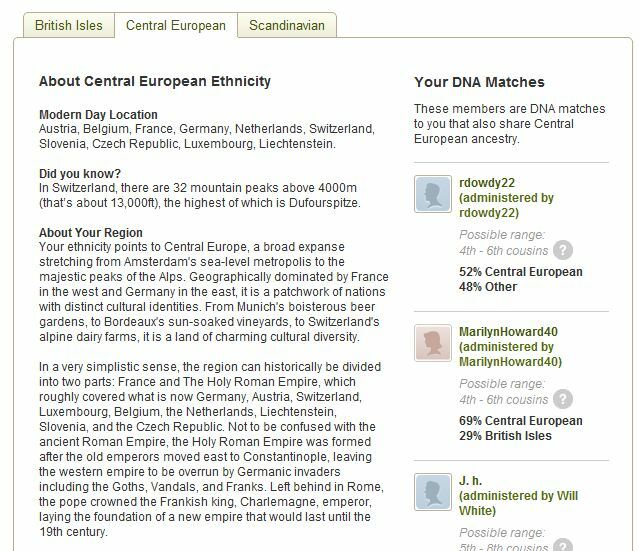 I am hopeful that Ancestry’s DNA database will grow, resulting in new leads and connections with cousins, and that FamilyTreeDNA may learn from Ancestry.com’s design to make their own user portal a bit more user-friendly. This entry was posted on Tuesday, March 6th, 2012 at 9:39 PM	and posted in DNA. You can follow any responses to this entry through the RSS 2.0 feed. Thanks for getting up such a quick review! Did you take the Family Finder test with FTDNA? If so, may I ask how many matches you have over there? I have 40 “distant” matches – which FTDNA is classifying as 2nd-5th cousins, and a total of about 190 speculative matches. I’ve been able to (almost) confirm a relationship to one potential cousin, but none others. As an ancestry.com subscriber, I also was offered this free DNA testing last November. However, I have not gotten a reply email yet. If you received an email yesterday, I hope my email will arrive soon. This is my first exploration into DNA testing and I’m curious to see the results. Thanks for the great summary blog post. Thank you for posting this information. I was very quick to jump on the free autosomal DNA test offer for the first 2000 existing Ancestry DNA test customers to respond, but nothing has shown up for me yet. However, between you and CeCe, I have a good idea what to expect. Thank you! I see the Beta page but so far no results. I have not received the email yet. It looks like they have a step that changes the page before the results are posted. Did you see that as well or had you not looked till the email came? I see a Beta announcement and place to click for Beta feedback, but I do not have any autosomal results yet. When I am in my account and click on DNA and then DNA Tests, all I see is the mtDNA test I did back in 2008. There is no pending autosomal DNA test showing though I received confirmation a long time back that they received my order. Do you show a pending result for the Beta? Same here. I was able to link my tree into my results, but my results aren’t showing. Also, I have to make a decision about my trees. I have one tree for my mother’s family and one tree for my father’s, but it looks like the DNA results only link to one tree…Am I strange for having two trees? I’m still waiting for my results too. I can barely wait. I have a tree for my mom’s side and another for my dad’s side also. When I give my feedback, I’m going to mention that in hopes that they will let the results be linked to more than one tree at a time. Today the web page changed format for me and I now have a line that says “In Process on 01/24/2012 “. I think that means they started the test then but the results still have not finished. Since they probably had to replicate the sample many times that was left from my origional test the amount of time required for that may vary depending on Y-DNA or MTDNA and how old the origional test was. Older tests may have degraded and that may cause some of them to need new samples. Thank you for mentioning the change in the web page format. I just checked and when I click on the DNA tab at the top of the ancestry.com page, I see “In Process on 11/15/2011” and that is about the time they would have received my DNA sample. Boy, it sure is taking a long time. Well if you want to believe people who aren’t possibly related to you, are cousins that’s fine! However I believe in resarch. Their matches ( and there are a lot ) don’t match one single name in my family tree! Thanks for posting about this. I looked at my results yesterday but was disappointed that my pedigree ethnicity was so different than my genetic ethnicity, enough to think perhaps there is a problem with my results. 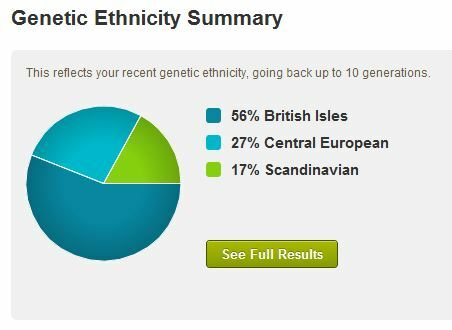 For instance, my results state that my genetic ethnicity is 91% British Isles, 6% Russian/Persian/Turkish, and 3% Other. This does not match my pedigree. My pedigree on both sides of parents is predominantly French, as most of my ancestors were French colonists of Canada, Acadia, and Louisiana. Out of the nearly 3,000 people in my family tree, I have none that are from the Russian/Persian/Turkish part of the world… that was a total surprise (although my surname is from southern Spain, perhaps there was a migration or something to that area from way back). Based on my pedigree, I would expect my genetic ethnicity to be around 50-60% Western or Southern Europe and the rest to be British Isles. I just find it really odd that I received no “hits” for Western Europe (France/Spain) given this is the predominant portion of my family tree. I sent feedback to Ancestry, but I was curious if anyone else has something similar to this or could anyone provide some insight for me? I just wonder if since most of my ancestry is from French colonists of North America, then perhaps they are confusing the results with the British colonists of North America? I had one person that was a 4th cousin match, and in fact we had some common ancestors. Based on their family tree, many of their ancestors were French Canadian and Louisianan as were mine and their results were 86% British Isles, 6% Southern European, and 8% Other… which again, seems kind of odd. Danish Vikings. Does this help to understand why your DNA can show the Ethnicity of the British Isles? A good book to read might be the Penguin Historical Atlas of the Vikings if your local library has a copy. Hey, you missed a spot! My results said 76% British Isles even though my grandfather was French Canadian. My mom’s mother’s family is Swiss/German and none of this showed up in the Ancestry test. It also claimed 12% African (split evenly between East and West – yay, that makes sense!) and there is no African ancestry in my family, at least not in the last 600 years. I call bs. You, perhaps, had a few light complexioned black ancestors (children of slave owners and black women),who passed for white , crossed the color line and married white spouses. Their African heritage was,thus, deliberately hidden and ultimately forgotten about. Only via DNA could the surprise pop up. I can’t wait to get my results back and compare them to yours. I, too, am Cajun and my grandmother’s name was Spanish, Segura. I had a similar result. Most of my relatives are from Northern Germany my one grandmother was from what is now Romania. Yet they told me I am predominantly from the British Isles with a smack of Eastern European. They have sent me “matches” that share nothing with my background. I am very disappointed. I got my results back from ancestry.com 2 weeks ago. I am 57% West African, 41% British Isles and 2% uncertain. This is largely what I expected, as I have a sizable quantity of well documented British ancestry.However, what did not show up, are my well documented 17th century ancestors from the Netherlands and Flanders, along with a small quantity of Native American ancestors. These ancestors probably make up the uncertain 2%. I can ,perfectly understand why. Because the amount of their DNA is so small that itt just did not register. Also, you must bear in mind that WHOLE SIBLINGS WITH THE SAME MOTHER AND FATHER can have different DNA. If any of you who have received your results could share a couple screen grabs from your account with me for a presentation that I am giving on Thursday, I would really appreciate it. I had hoped to receive my results in time, but no luck! I would, of course, anonymize all info before using, like I have on my blog. If anyone is willing, please send to yourgeneticgenealogist@gmail.com. Nothing has come in for me yet. A fiend got his 2 days ago and they used the sample from his mtDNA test that he did several years ago. Mine is also mtDNA, from 2008 so I guess it was still viable as I have not been asked to submit a new sample. He received a email notification from Ancestry when his results came in. Anyway, if I had results I would share them with you for your presentation. Sorry! I hope your presentation goes well. March 24th and still no results. I have a line on the DNA page that says “In Process on 11/30/2011. I have connected the non-received results to my tree and am given a place to provide feedback on my non-received results. Not sure why some people who submitted later are getting their results back sooner? My “in-process” date is the end of January even though I know I was one of the first 2000 to respond (before they offered kits to the next 10,000 to respond), and I have received no results to date. I am disappointed that Ancestry does not list batch numbers or estimated completions dates like they do on FTDNA. So, still waiting…..I bet they are waiting for National DNA Day of something. Is so, that is April 20th. Anyway, I share your frustration. JJ, I received the same email on April 1, and I have no results yet either. 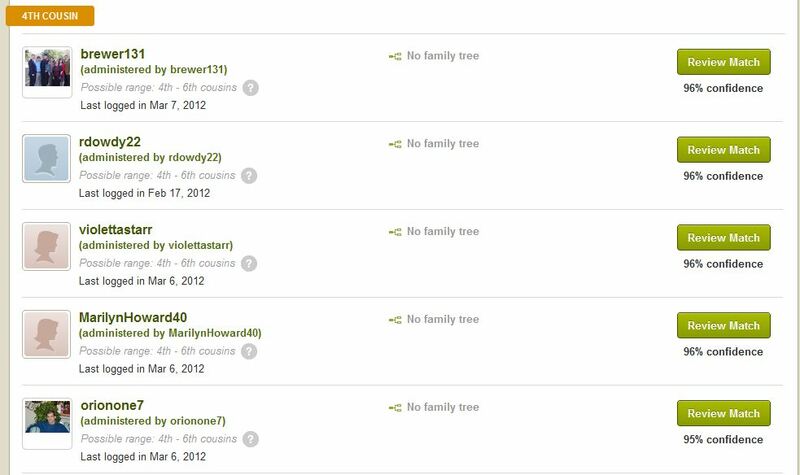 I feel like all the people at Ancestry are saying “April Fools!” I sent them “Feedback”, but I haven’t gotten a reply. I just received my mother’s results. I just looked and they were there even though I did not receive an email notification. It says they were completed on Feb 14th, which is strange since they weren’t there yesterday. My results did show up the next day, but I had had my dad’s mtDNA sample on file with ancestry.com included in the beta test, plus I purchased a new test for myself when the second invitation was extended. I was really, really anxious, though, to know where the link to my sample was…Would it just show up?? I had emailed several times and been reassured his sample and my new one were both being included in the results. Never-the-less, I called the ancestrydna customer support the day after getting his results, and the guy had to talk to the other folks there. Turns out they hadn’t seen anyone with two samples, such as my situation, and there was a bug. The results I saw were mine (my mom’s half Spanish) and my dad’s sample had been associated with a default, basic ancestry.com account, as is done with customers who have not existing account. His sample as shows a 1/24/2012 activation date, and what I am guessing is they had to work out how to transfer existing samples to perform the new testing and such, while new samples were easily processed. Or perhaps they got excited to begin processing the easiest samples to get more feedback sooner, rather than focus on samples they already possessed. Either way, where in the world would I get 52% Scandinavian??? I have a great-great-granddad from Normandy and some way back ancestors from the Hebrides and Argyll (the Vikings controlled those area for a long time), but there would have to be some spectacular statistical miracles for me that pure Viking dna to over and over and over be passed down in entirety to my dad and my mom…We have Irish (Northern Protestant and Catholic, lowland Scots, French from other regions, German from Saarbruecken, possible Welsh, English, southern Native American (great-great-grandmother who was ashamed and wouldn’t tell which tribe(s)…And none of these show up! I let ancestry.com know, and I hope they are taking the feedback seriously. We need to let them know of our backgrounds, in case it might help them pinpoint the places where matching is not as accurate as it should/could be. Glad you got it all worked out anyway. Maternal Dna. They say that your dna is the same as your mom. That doesn’t make since if they test to see who the father is, does it? a female gets none of the dna of the father, or does his mother to mother line is part of his daughters. I am confused about that. if the male has both, why don’t you get the dna of him that’s not from the y chromosome? Everyone has DNA from both parents. It’s the mitochondrial DNA that you only get from your mother. My test says I am 51 percent Scandinavian and 49 percent British Isles. 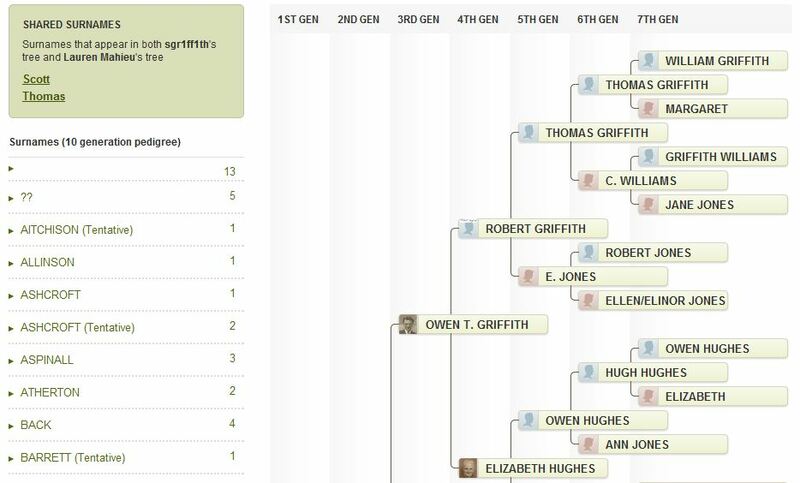 I have a well-documented genealogy with virtually all of my ancestors coming from the British Isles, with the exception of a Native American ggg-grandmother (which wasn’t even detected). I am aware that the Vikings colonized many parts of the British Isles beginning in the 8th century, and I can certainly accept that I have some Scandinavian ancestors, but not half. Is AncestryDNA also categorizing the Anglo Saxons, who invaded the British Isles in the 5th century, Scandinavian? They came from Denmark, originally. This is needlessly confusing, because the Anglo-Saxons have been in the British Isles for 1600 years, and created the language, English. Ancestry DNA needs to specify which markers it is using to declare someone “Scandinavian,” etc. I just sent into ancestry.com for the DNA. From research I have read you have two tree’s the one on paper and your genetic tree. Genes actually dilute as you go further back, and you may not always inherit all of your ancestral genes. So the test to my intrepretation is the DNA you have actually inherited, it may not include all of your ancestors. You may even have genes inheritated from 1,000 years ago. My paper tree is done back 500 years, so I am curious as to what genes I have picked up through these years. I am on paper French, German, Czech, and English. So it should be interesting to see what else pops up. I totally agree with your statement that they need to clarify what they consider each ethnicity. My immediate lineage is of the following: German, Irish, English, Scottish, French, Slovak, Hungarian, Croatian, and Native Cherokee. My results showed 93% British Isles and 7% Persian. Really??? I have tons of German, French, Cherokee and Slovak in the current 4 generations of my tree and nothing was passed to me. Very strange and makes me question the validity and control of this particular test. I already have results from an mtDNA test that show everything I already knew. Something is seriously wrong with this test and I pray it gets “upgrades” quickly as they fix things. You get 50% of your DNA from each parent. Your lineage may reflect various ancestry but your DNA may reflect a small amount. Ireland, Scotland and Britain are probably the main DNA portions that you inherited, as reflected on the 93%British Isles. All those other ethnicities you claim are “immedate” may simply not be reflected in your DNA. That doesnt mean they arent part of you. It’s funny, 7 months after your test I have similar results. I just got my results today and they say I am 100% British Isle descendant. I see from your post people you could be related to and most of them are on my list as well. I have known that most of my tree comes from the British Isles, but always thought that others came from Germany, France, Luxembourg. Knowing of the invasions and settlers, I am curious as to the differential of people from central Europe, i.e. the countries named above and what DNA they left in the Isles. Would love your opinion. My 100% Italian second cousin came out 37% European Jewish, also Turkish and Persian. Really? I think this test is not a very good or reliable way of checking your ethnic background. It did show the relationship between me and my cousin though. I give this test a C-. They need more test subjects…and more research. Your review was ok, but I doubt your test was “free.” No one receved a free test, but some received invitations before others. Some of us were able to upgrade our existing DNA tests for free, through an offer to use the samples they already had for us in their storage facilities. That was before they offered any ancestry.com user the opportunity to order a free test if shipping was paid. @DME – Actually, it was completely free to the first 2000. I was one of them as was Lauren. Mine was fee also. It was free to the first 2000 existing Ancestry.com customers. Then they offered it free to the first 10,000 existing Ancestry customers before they began charging 99.00. Now it is available to everyone but the price has gone up. I paid $100 for mine, although I was “invited” and told this was a special price for the first 2000! I got it for myself as a birthday present. I am very very disappointed. Most of the people they have matched me to ( and there are a lot ) have their trees marked “private” and don’t want to share. What’s the point, in doing research, if you are not willing to share? Mine is public to all! Agreed. I had high hopes and low on luck and expected great things. I paid the “special” price November 2012 and have hundreds of matches. I think basically if you have someone from Ireland you are matched to everyone else that has an ancestor in Ireland. It matched me and my father (of course! ), a 3rd cousin to me, some 4th-6th cousins, plus I’ve found some people in my distant relationship categories. And there indeed are people my dad matches that I do not. Might not be perfect, but I think some people will have more matches as the database of samples grows. I do find more matches on my dad’s side, which has been in the US since at least the late 1600s/early 1700s. I have few matches on my mother’s Canary Islander/Spanish and French side, which has been relatively isolated SE of New Orleans for 200 years. That’s a surprise! I haven’t matched anyone on my family tree! Guess I must be adopted! mine wasn’t free. I was on a waiting list for 7 months (April-November) and let my usual guard down and didn’t even check what I was supposed to get and I got nothing. I would like to know, what does it mean to have middle-eastern blood %, is it more from the Arab side or Israelite side? Oops! Correction above: “know wood” should be “knock wood”. Sorry! I’m interested to see some mergers between the big players in the genetic database space to really give some serious insights. Time will tell. the theme/design), I don’t have time to read it all at the minute but I have bookmarked it and also included your RSS feeds, so when I have time I will be back to read more, Please do keep up the fantastic job. How to join free Ancestry.com autosomal DNA test…I look Scandinavian and Irish, wanna know more! Thx. After reading all of your posts, I wish I hadn’t even took the test. Everyone seems so disappointed and it sounds as if the results are a guess at best. I ask Ancestry if we received a certificate of some kind stating our ethnicity, of course they said no. I really wonder now just how accurate they might be and I am wishing there was some place to go to have accurate registered tests done, test that you know are accurate and the test takers certify their results. If anyone knows of such a place, please let me know. I would rather pay more money and have an accurate test done, than to have a reasonable hit and miss. I contacted our local hospital lab, hoping they might know of a testing agency but they acted like they didn’t even know what I was talking about. I think it is a joke that an agency that is based on ethnicity can not provide us with certified results. Science now knows, more than ever, about our DNA and how to pinpoint the exact results. Other DNA tests are usually 99.9 %, why can’t we have that kind of accuracy? I am afraid I am going to really regret this whole process. I feel so sad about something I was initially so excited about. I just sent my test in last week, and I am nervous also. Now I’m not so sure about how much of my test will be accurate. It says lab processing from my test on the website. Have you gotten your results back yet? post like this. I was totally sick with your publish you shared.